Millions of Whales Affected, or Negligible Impact? Common Sense Precautions or Undermining Sailor Safety? Who is the Champion for Ocean Protection? Since 2003, the Natural Resources Defense Council (NRDC) has held the Navy's feet to the legal and regulatory fire on all aspects of its active sonar training programs. In that year, an NRDC legal challenge to the Navy's new Low-Frequency Active Sonar system resulted in a joint agreement that the powerful sonar (which can spot subs hundreds of miles away, and be heard for over a thousand miles) would be used only in a remote area of the western Pacific, while the Navy revised its Environmental Impact Statement to address legal shortcomings. (Not coincidentally, that area was within listening distance of China and North Korea, the two countries we are most concerned with monitoring; the US continues to deploy its two LFAS-outfitted ships in that region, even after getting new permits to operate worldwide). In 2004, NRDC began pushing the Navy to implement NEPA procedures to cover its longstanding use of mid-frequency active (MFA) sonar, which can spot subs tens of miles away, and be heard for perhaps a hundred miles. MFA sonar has been used to locate submarines since at least the 1980s (with continual changes/improvements in the signals being broadcast), and is now widely deployed on over 150 US warships, and a total of at least 300 worldwide. The Navy had never produced Environmental Impact Statements for its use, but a widely reported stranding incident in the Bahamas in 2000, along with a few other similar incidents involving NATO exercises in Europe, raised the bar for legal compliance with NEPA, which requires EISs for activities that may cause impact on wildlife. In 2005, NRDC sued to assert the legal requirements of NEPA, though an agreement reached in late 2008 took the issue out of the courts. 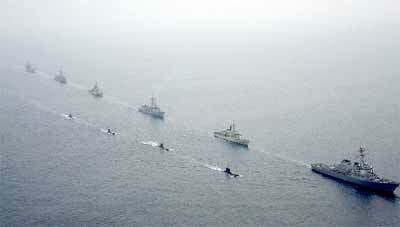 Meanwhile, from 2006-2008, NRDC and other environmental organizations (as well as the State of California) aggressively challenged several specific Naval training exercises, spurring Federal District Courts in Hawaii and California to impose more stringent safety measures than the NMFS had called for in permit conditions developed in collaboration with the Navy. NRDC has claimed that these rulings vindicate its insistence that "common sense" precautions can allow Naval training to proceed without undue harm to marine wildlife; the Navy has responded with increasingly detailed complaints that the additional measures impede its ability to train effectively. The arguments made in response to these cases provide a good sense of the "end-game" debate that will be taking place during 2008 and 2009 as the Navy Environmental Impact Statements attempt to provide a legally sturdy justification for its procedures. But, can either the Navy or NRDC statements be taken at face value? This AEI FactCheck will attempt to decode some of the rhetoric coming from both sides, and to discern to the best of our ability the areas where each appears to be on solid ground, and conversely, where they are perhaps a bit over their heads in hyperbole. We've based this analysis on statements made by Navy and NRDC personnel quoted by the media, press releases and magazine articles published by both parties, documents produced by the Navy in conjunction with its EIS process, and public comments submitted by NRDC in response to draft EISs. Navy: In a handout created as part of the public comment meetings for one of the early EISs (AFAST, which encompasses much of the US East Coast and Gulf of Mexico), and in many other public statements, the Navy says that active sonar has been "correlated" with five marine mammal strandings worldwide from 1996 to 2006, with a total of 51 stranded animals and 37 mortalities. The Navy also stresses that these few strandings share specific limiting factors, without which they consider the risk of fatal injury to be minimal or non-existent: unusual (steep and complex) underwater geography, significant surface ducting (a layer of water that allows sound to travel farther than usual without losing its intensity), limited egress routes (constricted channels making it hard for animals to move away from sonar), multiple ships using sonar, and a specific species of marine mammal: beaked whales. AEI FactCheck: This one depends on what your definition of a "link" or "correlation" is. The Navy limits their list to events at which there is a close correlation in both time and distance between sonar use and multiple strandings, with a likelihood that whales were "trapped" between a moving sonar vessel and the shore, and thus unable to escape; in cases after 2000, tissue has been taken from dead bodies, and examinations revealed the currently accepted "smoking gun" of sonar-induced injury, a set of specific tissue damage that appears to be triggered by disrupting beaked whale dive patterns in ways still not understood. The events acknowledged by the Navy (Greece 1996, Bahamas 2000, Spain 2000, Canary Islands 2002, Spain 2006) are the baseline for sonar-related strandings, but it is unlikely they are the whole story. Hawaii 2004: This event is often mis-characterized in press reports as a "mass stranding" of 200 melon-headed whales during the biannual RIMPAC exercises. NRDC correctly notes that only one young whale died, as the rest crowded into shallow waters. While initial Navy reports said that the congregation occured before sonar exercises began, it appears that sonar calibration began earlier. The official NMFS report concluded that it was "likely, if not probable" that the whales headed into dangerous shallow waters as they were attempting to avoid the sonar sounds. (ed. note: I've often wondered at that choice of wording, which is itself ambiguous: are they saying that it is not probable, or that it is probable? It can be read either way. A later clarification statement from NMFS confimred they are not convinced sonar was the cause, and included an intriguing mention of a similar congregation of melon-headed whales on the same morning, after a full moon night, in the Western Pacific) The Navy maintains that similar in-shore events involving pilot whales have been observed when no sonar is in use, and continues to deny a connection to sonar in this incident, though to observers at the time it appeared obvious that the animals were agitated, and surely far from their normal deep-water habitat. Puget Sound 2003: NRDC and others chalk up as many as 11 harbor porpoises as victims of the USS Shoup's MFA sonar exercise. Many witnesses saw a pod of ocras react with unusual clustering and apparent disturbance that day, with some humans in nearby boats hearing the sonar pings out of the water or through their hulls. The orcas' behavioral response, with the Shoup visible in the distance, was perhaps the most dramatic ever directly witnessed by humans, and provides vivid, if circumstantial, evidence of the distress that animals can experience in response to sonar sounds. The Navy claims that the orcas did not experience dangerous sound levels, and implausibly rejects the idea that the reactions seen by longtime orca observers were unusual. The dead porpoises were found in the days following; none were fresh enough to test their tissues, and many appeared to have died in the days or weeks prior to the Shoup event. In general, dolphins and porpoises have not been associated with sonar strandings, so the connection here is tenuous at best. Time/Distance - Some of the NRDC-listed events, plus a new one in early 2008 in Scotland, push the previous limits of the time/distance correlation of strandings. The Navy has certainly not accepted that strandings taking place several days or a few tens of miles from sonar activity can be causaly connected. Many environmental advocates contend that it is likely that most sonar fatalities take place far from shore, with the victims sinking, as most whales do when they die. In North Carolina in 2005, over thirty whales of three species came ashore and died several days after sonar exercises took place fifty or so miles offshore, while in Scotland in early 2008 at least 19 beaked whales drifted ashore, most after apparently dying up to two weeks earlier perhaps a hundred miles from shore; sonar activity is still unknown for this event. The possibiilty that whales may experience either fatal (as in Scotland) or non-fatal (as in NC) injuries far from shore, and then beach many days later, remains an open line of inquiry, though firm proof may never come. This is a class of sonar impacts that the Navy simply does not consider, and one that NRDC and others consider crucial to keep an eye on. "Additional, unknown levels of injuries and mortalities of Cuvier’s beaked whales may occur as a result of anthropogenic sound, such as military sonars or other commercial and scientific activities involving the use of air guns. Such injuries or mortalities would rarely be documented, due to the remote nature of many of these activities and the low probability that an injured or dead beaked whale would strand." Gas and fat embolic syndrome and steep, enclosed waters as the only "proof" - Is the Navy justified in accepting responsibility only for dead whales that show either the specific tissue damage that has been conclusively correlated with sonar exposure, or that died after training taking place close to shore with steep canyons and limited escape routes? The best example of this is the North Carolina strandings in 2005, noted in the previous section. NMFS examinations did not find the classic sonar-related tissue damage, but also failed to find any other definitive cause for the deaths (i.e., no other known pathogens, toxins, or health issues were found). This lack of clear physical evidence, along with the fact that Navy ships were far offshore, led the Navy to conclude that sonar was unlikely to be involved, despite the fact that so many whales of several different species were involved (virtually all "natural" strandings involve either just one or two animals, or groups of a single species, all victim to the same illness, hunger, or toxin). Termed "gas and fat embolic syndrome," the telltale set of tissue damage is caused by hemoraghing of organ tissues, including lungs and liver, caused by nitrogen bubbles expanding in the bloodstream, presumably due to un-natural changes in the dive patterns of beaked whales (not necessarily rising too fast, ala human divers getting "the bends," a related response: recent studies suggest the trigger may be a near-surface series of dives as a whale tries to escape sonar signals). But the larger question hovers: is this the ONLY physiological indicator of sonar-related injury? And what of behavioral responses that cause more standard injuries? It is entirely possible that simply fleeing sonar signals could drive animals to beach, with injuries then sustained on shore being the "cause of death" (indeed, some sonar-related events are characterized this way, leaving sonar-induced responses out of the equation). Likewise, there could easily be as-yet unidentified injuries related to either sonar exposure or fleeing behaviors. While the Navy can make a narrow scientific case that animals are unlikely to be injured when they have escape routes, we are still in the early years of investigating these incidents, and much remains to be learned. Therefore, there is reason to question the Navy's strict limitations on sonar causality; it appears that any event that is not absolutely certain or highly likely is quickly pushed under the rug, whereas an acknowledgement of a separate class of events in which sonar impacts are possible, though not confirmed, would be more constructive in developing a complete picture over time. Whether there have been five sonar-related strandings in the past dozen years, or fifteen, or even hundreds of events causing unseen deaths at sea, it appears certain that far more marine mammals die of other human-induced causes, and that most sonar transmissions do not injure animals. While this is an inconvenient truth for environmental issue-building, it is hard to deny. The Navy cites a figure of 600,000 marine mammals killed by fisheries activities each year, most entangled in nets; they also make quite a show of listing all the other known causes of whale strandings (toxins, disease, navigation error, etc.). While we have not cross-checked the 600,000 figure, the general point is indisputable. However, as many environmentalists point out, other causes of death are in many ways irrelevant; do we consider cancer deaths to be unimportant because so many more people die of starvation worldwide? Also, as we'll discuss below, the number killed is not necessarily as important as widespread and repeated disruption of the normal behaviors of sea animals. While we cannot be certain that deaths are not occuring out of sightand in fact, it is probable that many victims of sonar injury do die at seathe likelihood is that NRDC's attention-grabbing tagline that "sonar kills whales" is hyperbole at best, and a misleading distortion from a few incidents at worst, a mirror-image of sorts to the Navy's narrow definition of how many strandings are truly related to sonar or that gas-fat embolic syndrome is the only fatal result of sonar exposure. While the Navy (and some researchers) set a high bar of proof, insisting that less than 50 whales are known to have died as a result of sonar exposure, and expressing exasperation at environmental advocates for generalizing or making unsubstantiated inferences, it is difficult to avoid the complementary observation that to insist on the veracity of these low numbers is to willfully ignore the vast uncertainties at play. While it is surely valid for the Navy to talk about how many deaths have been clear enough to to have met standards of scientific proof of being caused by sonar exposure, it is misleading to contend that the scientific research standard of certainty is the only valid threshold of concern, and thus it is a big stretch to present these low numbers with any real authority as the final word on the topic. In recent months, it appears that the Federal Courts, as well as many environmental advocates including NRDC, have moved beyond a narrow focus on the relatively few deaths related to sonar exposure, and have been emphasizing the less dramatic but far more numerous and widespread behavioral impacts of sonar sounds. For example, the Navy's Atlantic Fleet Active Sonar Training (AFAST) EIS estimates that 2.7 million marine mammals per year will be exposed to sound levels that will cause them to change their behavior in some way, and NRDC is hot on the case in their official comments, suggesting that these numbers should impel the Navy to consider alternatives in which sonar training is limited to much smaller areas (which we may presume will become the foundation of future legal challenges). Similarly, the California District Court judge was obviously troubled by the Navy's estimate that 170,000 whales would hear sounds loud enough to change their behavior during the two years of exercises that were at issue in that case. Most commonly, these behavioral responses involve moving away from the noise sourcesometimes moving away from preferred foraging or mating areas, but probably most of the time simply shifting their current foraging location by tens to hundreds of meters. More dramatic responses include sudden dives, unusual group clustering or other behaviors seemingly reflecting distress, cutting short of foraging dives, and changing call patterns. A UK military study made public in August 2008 indicates that beaked whales may dramatically reduce their vocalization and foraging dives when they hear MFA signals. [SEE NEWS STORY] The question is, how do these repeated minor behavioral impacts add up? Are individuals or populations stressed in ways that can affect overall population vitality? In regulatory terms, there are two "levels" of impact on marine mammals. The Navy must apply for Incidental Harassment Authorizations (IHAs) from NMFS, which, in issuing the permit, outlines necessary mitigation (i.e., procedures to minimize impacts), and determines that the activities are not going to cause population-level impacts (i.e., too many deaths or reductions in breeding success). The Navy calculates the estimated number of animals to be affected when it prepares EISs or applies for IHAs. In some regulatory channels, "harassment" is also called "takes"; this term often causes confusion, as it implies that animals are killed, when in fact, behavioral effects are also considered "takes." Level A Harassment is any exposure to sound that causes physical injury. While death or gross physical injury such as tissue hemorraging is obviously Level A Harassment, this threshold is considered crossed when an animal is subjected to sound loud enough to cause permanent hearing loss, termed Permanent Threshold Shift (PTS). Compared to the wide range of sound levels that trigger behavioral impacts in different situations, there is a rough equivalence among different species in what sound levels cause hearing damage (though debate remains about methods used to estimate PTS thresholds). By using this criteria, developed in research done on captive animals, the Navy and NMFS use sound modeling to estimate how far from a sonar source the sound would be loud enough to cause injury. Level B Harassment occurs whenever an animal changes its behavior or experiences temporary hearing loss. Behavioral changes include moving away, changing dive or breathing patterns, or changing vocalization patterns. There is far less consensus about what sound levels trigger such reactions; it appears that there is much more variation between species, as well as dramatic differences in indivdual sensitivity to sound, and marked variation in behavioral response in different situations (eg, foraging, migrating, with or without calves, etc.). A baseline level of 120dB is emerging as a conservative estimate of noise that can trigger behavioral changes, based on what appear to be the most sensitive individuals, species, and situations. Temporary hearing loss, officially termed Temporary Threshold Shift (TTS), occurs when ears become fatigued by loud sounds over some period of time, causing the threshold of audibility to increase (humans often exprience TTS at loud music or sporting events; for some hours after leaving the event, we need others to raise their voice a bitor a lotin order to hear them well). Navy: The Navy and the National Marine Fisheries Service (in issuing IHAs) has tended to term virtually all Level B Harassment as "negligible impacts," since these impacts are temporary and transient. The thinking is that even when accounting for cumulative and repeated exposures, these changes do not significantly reduce the population's overall health. Mitigation is designed to protect animals from Level A Harassment (physiological injury) and to account for the seemingly increased sensitivity of beaked whales to as-yet undetermined behavioral responses that can sometimes lead to injury, beaching, and death. The Navy and NMFS look at overall population figures (which are often imprecise) in determining whether the estimated number of either Level A or Level B "takes" will cause significant impacts on the population as a whole. NRDC: NRDC, and the Federal Judge in California, have zeroed in on the Navy's own figures that summarize total Level B Harassment, and find that the huge numbers of Level B impacts are, on their face, unacceptable. For example, in its public comments in response to one of the Navy's early Draft EISs (for the Atlantic Fleet, AFAST), NRDC makes a vigorous argument that the projected 2.7 million Level B Harassments are clearly unreasonable, and that the Navy should therefore consider more alternatives that reduce the number of sonar trainings and/or the areas in which they are allowed to take place. AEI FactCheck: The Atlantic Fleet Active Sonar Training (AFAST) DEIS does indeed estimate that 2.7 million marine mammals will be subjected to Level B Harassment. This may well be a prime example of how ethical considerations color the reactions to ocean noise issues. For those who believe that we humans should be more mindful of the impact of our actions on wild nature, this number rightfully indicates that massive amounts of noise are being introduced into the oceans. Whether the impact is temporary hearing loss or swimming a a few hundred meters to find quieter waters, the conclusion is the same: we should find ways to make less noise. From this perspective, we have an obligation to do our best to make noiseespecially intense noise like sonar pingssparingly, and with real consideration of the rights of animals to be left in peace. Conversely, looking more closely at the numbers, a legitimate case can be made that these estimates are not nearly as alarming as they appear at first glance, and that the practical effect of even likely repeated exposures may be nothing to be especially concerned about. In worst case scenarios, it's unlikely any individual animal will hear sound loud enough to trigger a behavioral response more than once every couple weeks; in most cases, animals will be unlikely to hear sonar more than a few times a year. And, the vast majority of these incidents will involve faint sounds, and very modest behavioral changes, with only a small proportion in the areas close enough to sonar ships to trigger dramatic behavioral change. From this perspective, the ethical dilemma really only kicks in when our noise is loud enough to cause injury or long-term population effects. There is little we can do to resolve this ethical dimension of the question, which is likely to grow in importance as the public becomes more involved in these issues. These subjective considerations are increasingly being overlaid on the facts and figures that are available to us; it is crucial that we acknowledge the reality of these ethical overlays and respect the validity of individual differences in judging what is acceptable, even as we continue to do our best to make sense of the scientific, operational, and regulatory choices being made year by year. Millions of exposures, millions of animals: How often is each animal affected? No range-specific population figures are presented in the AFAST EIS, but it appears that the Navy is estimating roughly 1-4 exposures per year per animal for most species. For example, the EIS estimates that 179,000 pantropical spotted dolphins will experience Level B harassment; stocks are estimated at 95,000 animals (meaning an average of 2 exposures per year per animal). 368,000 Striped dolphins will be affected, with a population of 100,000 (4 per animal per year). 15,000 sperm whales will be affected, with a population of 6,100 (2-3 per animal per year). 6000 humpback whales will be affected, with a population of 12,500 (half the animals will respond to a sonar ping each year). 389,000 Atlantic spotted dolphins will be affected, with the population being 82,000 (between 4 and 5 exposures per animal per year). 762,000 bottlenose dolphins may be experience Level B harassment; stock estimates total 122,000, also six per animal per year. Bear in mind that I am pulling these figures out without site-specific information (which is not provided; the Navy does not have more specific information, though it is working to get more precise population estimates; however, it also appears that the Navy does not wish to operate in site-specific areas, but would rather have free reign within its extensive offshore Ranges). These universal estimates may be close to meaningless, as they are based on the unlikely case of exposures being evenly distributed throughout the entire population, which is also assumed to be spread evenly through the region. It is entirely possible that a small proportion of population (living in regions frequented by Navy operations) could be far more regularly affected. If so, it is likely that some individuals will be exposed more often than others, shifting the weight of impact significantly. If, for example, a quarter of the population received all the exposures, then the exposure levels noted above would be 4x as frequent. In this case, each affected pilot whale or bottlenose dolphin, for example (the most heavily impacted species) would each react to sonar signals twice a month. It should also be noted that the vast majority of animals making behavioral changes counted as Level B Harassment will be at the far edges of sound propagation, and thus making relatively subtle changes in their behavior. Think the situation through for a moment (we'll begin with a simplified 2D picture, then consider it in 3D): sound propagates out in a circle from the ship emitting sonar signals. The very center of this circle (within dozens or a hundred meters at most) will have physiologically harmful levels of sound (Level A Harassment), with a ring beyond that of relatively high levels that may trigger TTS or major behavioral reactions. But this accounts for only a small proportion of the radius of the circle, perhaps (to use a rough and likely overstated estimate) a quarter of the radius. Beyond that, the sound is audible, and will indeed trigger responses, but increasingly smaller proportions of the animals will respond, and in decreasingly noticeable ways. The circle goes all the way out to where the sound is just audible enough to cause any reaction at all in a few animals. That inner quarter of the radius--where the dramatic effects occur--contains only one sixteenth of the area of the entire circle; thus we can see that 15/16 of the animals hearing the sound are are only mildly impacted. If we move into a more realistic half-sphere of radiated sound (from the surface, down and out), the proportion of Level B impacts that are severe is even more dramatically reduced: the volume of water (and thus habitat) in the inner quarter of the half-sphere is roughly one-sixtieth of the total volume. Thus 59/60th of the animals affected are relatively mildly affected. Even if we assume (quite surely exaggerating) that the realm of severe behavioral impact goes out to half the radius, then the area outside that zone is 4x as large, and the volume of the outer realm of the half-sphere is 8x as large (so that 7/8th of the animals counted as Level B Harassments are likely making only modest behavioral changes. Granted, the above "thought experiment" is only a very rough guide, but it is important to not over-simplify our sense of what the Level B Harassment numbers really mean: we're not talking about 2.7 million animals fleeing in panic. Still, those ethical questions arise: some people still feel that disturbing the same animal, even subtly, every couple of weeks is not acceptable. And, what of that 1/60th of animals who are in the inner area of the sound-sphere? That still adds up to 45,000 relatively dramatic reactions to sonar pings over the course of a year, likely including sudden dives, interruption of feeding or perhaps breeding, or more energy-intensive moves of a greater distance to get away from the noise. In current EIS and IHA modeling, the Navy and NMFS make some important choices about how best to model both the amount of sound being experienced by animals, and the degree to which they respond by changing their behavior. Everyone involved in ocean noise issues (scientists, regulators, and environmental advocates) makes judgement calls about what sound modeling or measurement system makes the most sense, how to guess when behaviors will be changed, and how important these changes are. In evaluating the current state of knowledge, the Navy and NMFS have chosen to approach the questions using the following mathematical and statistical techniques. Though it may be difficult for most laymen to understand, there are many different ways to measure a given sound, and more so, a given series of sounds. Most of us probably feel that we experience any sound as having an inherent intensity. However, the ways our measurement tools quantify that sound will differ depending on many factors; most importantly, if the sound (especially a loud sound) is long lasting or repeats itself over an extended period of time, our bodies will gradually become fatigued, or even injured, over time by the accumulation of acoustical energy. Sound Pressure Level (SPL) measurements quantify the instantaneous intensity of a sound. Most research into the effects of high sound levels that took place before roughly 2004 used this approach, and much research still does, making it especially useful for comparing different studies. Even in those studies, ambiguity remains, for SPL can be calculated in several ways, including measuring the "peak-to-peak" energy (measuring the difference between highest and lowest energy in the waveform), plain ol' "peak" (highest instantaneous energy), or "root-mean-square" (which divides total sound energy of a sound by its duration, in an attempt to equalize measurements of sounds of differing duration). As you can imagine, the resultant SPL calculation will be different in each case (progressively decreasing in the three examples above). Beginning in about 2000, researchers became much more diligent about clarifying which SPL they were measuring, making recent research more amenable to comparison between studies. Instantaneous measurements of sound are especially relevant to behavioral reactions, which tend to be triggered by the absolute volume of the sound, or the suddenness of its onset. Sound Energy Level (SEL), short for Sound Density Flux Energy Level, and often called simply Energy Level (EL) measurements take into account the cumulative impact of sound over a period of time (generally from several seconds to several minutes, though SEL can also track continued exposure over hours). This is much more useful for assessing the likelihood of temporary or permanent hearing loss, in which prolonged exposure to high sound levels causes temporary fatigue or permanent injury to tissues in the auditory system. Using SEL measurements in evaluating a repeating sound will result in higher SEL dB figures than would be obtained using instantaneous SPL dB figures. Beginning in about 2005, NMFS began to encourage the use of SEL in evaluating the effects of sonar signals; there has been some controversy among enviromental advocates, because in most cases the shift increased the regulatory threshold of what is considered a dangerous sound exposure. While this can appear on the surface as a softening of regulatory safeguards, the biologists doing these studies will see the two as equivalent, likely prefering the increased precision of SEL measurements. And indeed, using SEL allows greater protection from sounds that repeat for a long time; a 170dB sound (that would generally fall below regulatory limits) will be result in increasingly high dB ratings using SEL, the longer it persists, and may well cross a 180dB or higher regulatory threshold after a period of time. What is the Nature of the Sound? A still largely unexamined topic is how the nature of a sound affects the likelihood of a reaction. It appears that every sound of equal loudness (or dB measurement, however calculated) does not cause an equivalent response? Some observers consider the actual sound signals used by active sonar systems to have unusually "grating" qualities, like chalk squeaking on a blackboard. In addition, sonar signals can have relatively fast rise times (going from onset to peak intentity more rapidly than biological and natural soudns) or high "peakedness" or "kurtosis" values, a measure of the variability of the wave form (and in some ways, an objective way to address the "grating" qualities). Little investigation has taken place into the ways that different sound signals may be more or less disturbing to animals. Navy sonar signals come in many specific acoustic configurations, and so far, the choice about which to use is made based on operational factors, such as best propagation through the water, or creating the easiest-to-interpret echoes. It is possible that if biological sensitivity to the many signals was considered, there may be currently-available sonar pings that would still be effective, while reducing their impacts on animals' auditory systems. How Many Animals Are Counted as Level B Behavioral Responses? Beginning in 2007, NMFS and the Navy began adopting a new model to estimate how many animals would actually change their behavior in response to noise. Rather than pick an absolute sound level as the threshold of behavioral response, and assuming every animal experiencing that level would change behavior, and no animals farther away or receiving lower levels would be affected, a "dose-response" approach is now being used to estimate how many animals will react to sound at various distances. This is based on the obvious point (and research that affirms) that the higher the received sound level, the more likely it is that any individual will react. In simple terms, this approach assumes that most animals exposed to 180dB will exhibit behavioral change, and so will be counted as a Level B Harassment, roughly half of animals exposed to 160dB will respond, and a small proportion of those exposed to 120dB will respond. Sound propagation models estimate the area to be ensonified by any given sonar signal or exercise, then estimated population densities in the area are used to predict how many animals are apt to hear sound at each intensity. Finally, "dose response" formulas for various species are applied, to estimate how many of the animals will react at each distance, and come up with a total number of Level B Harassments. NRDC has objected to this shift, claiming that the studies the Navy has used to determine the proportion of animals likely to respond at any given sound intensity are not reliable indicators of actual responses. While NRDC takes exception to which studies the Navy has included in its developing its models, a larger question hovers over almost all studies of behavioral reaction thresholds: they nearly always involve captive animals, whose reactions may not bear much resemblance to behavior of wild animals, due to habituation to noise. The concern is that captive animals will be less sensitive to sound, especially low levels of sound, than wild animals. The effectiveness of any estimates of how many animals will expereince behavioral disruption is limited as well by the fact that response to noise, especially moderate noise, varies widely between species and within any given population, depending on what they are doing (traveling, foraging, mating, resting, etc.). Even if species differences are factored in, undoubtedly the largest uncertainty factor in this piece of the scientific debate is that current modeling used by the Navy is based on very general population figures and simplified pictures of how they react to sound. Known populations of each species are assumed to be evenly distributed within the species' range, when of course the fact is that they are concentrated in groups at any point in time, and are likely to spend most of their time in particularly favorable locations within their entire range. Thus, any given sonar exercise is assumed to affect some animals in any population whose entire range includes the exercise area, even though there may be none present in that location on that day (so, the Navy may well be over-estimating its impact); on the other side of the coin, when animals are present, it is likely that there will be more present than the models assume, since the models spread the entire population diffusely through the species' entire range (this time leading the Navy to possibly under-estimate the numbers affected). And, there is a third side of the coin, this one once again tipping toward a likely over-estimate of impacts: the Navy's model does not include any animals moving around; all populations are assumed static. So, the model assumes that during any sonar exercise, which may last for 15 to 120 minutes, all animals in the area stay in place and are repeatedly exposed to sound. Nearby animals are not "allowed" to move away into lower-sound areas, and distant animals never continue their travel into areas out of range of the sound. Of course, the Navy is well aware of these limitations in its modeling, and is actively engaged in more detailed population monitoring in its active ranges, so that more accurate models can be used in determining the likely numbers of animals exposed to sound during exercises. And, more sophisticated and dynamic modeling is under development, using "animats" that have built-in "aversion protocols" that allow them to avoid areas that the species is unlikely to inhabit (e.g., water deeper or more shallow than the "real" species is found in), as well as to move and forage within the modeling space, and to move away from specified sound levels. As these more sophisticated models and more accurate population distribution figures become available, the Navy will be incorporating them in their planning and permitting process. In the meantime, due to the long timelines necessary to write EIS's, there is an inherent lag, with the science progressing even as each Draft EIS is written, released, and commented upon. Certainly, NRDC and other litigants will have access to newer research with which to challenge Navy assumptions at each stage of the process. It is quite likely that we will see another round of lawsuits that ask judges with little or no background in science to assess the validity of the Navy's approach to each aspect of their estimates of impacts, both the absolute numbers of animals affected and the assessment of how biologically significant these effects are. One Federal Judge faced with this task, after filling the five hours he had alloted to arguments on these issues, commented that five hundred hours would hardly have been sufficient. The Navy is likely to base its legal defense of their EISs on the ground that they are using the best currently available science; NRDC is likely to try to present studies (both recent and older) that it feels the Navy omitted from due consideration in developing its estimates, and to continue its previously successful strategy of urging judges to make their own assessment of the Navy's choices, both interpreting the ambiguous science and modeling, and in setting mitigation and safety measures to balance environmental protection and training needs. A final and crucial uncertainty remains: moving forward from these EISs, how does the Navy plan to incorporate increasingly precise models or new findings about the causes of catastrophic strandings? Will their operational standards continue to evolve in a gradual way, or will the Navy begin a new EIS process every few years to incorporate new understanding of populations, better models, and new research into species-specific responses to noise of various kinds? Given the Navy's insistence over the past few years that it knows best what is safe, can the public and environmental organizations trust that the Navy will adapt its operational procedures if new data calls for it? This question is especially sensitive, given the likelihood that new information will continue to be less than absolutely definitive; how much certainty will the Navy require before incorporating new results? In 2007, when the Navy received an Presidential exemption from the Marine Mammal Protection Act in order to give it time to conduct full Environmental Impact Statements on sonar training without being sued in the meantime, the Navy adopted a set of "29 Protective Measures" meant to provide adequate protection to marine life. Since then, the Navy has stuck to its opinion that these 29 measures and mitigation practices represent the best science-based balance of environmental protection and operational flexibility, and indeed, early Draft EIS's generally hew to these same standards. As used in these situations, "mitigation" represents operational practices that are meant to acknowledge the potential for harm, and to adjust procedures in ways that will minimize or avoid the possible harm. Examples of mitigation include: staying out of key habitat, reducing the power of sonar transmissions when sea life is nearby, increasing the thoroughness with which lookouts search for marine mammals in the area, and using larger safey radii in situations that have proven to be problematic in the past. Meanwhile, however, environmental groups, the California Coastal Commission, and two Federal District Court Judges have asked for more stringent mitigation to prevent harm, including coastal no-sonar zones, larger safety areas, and avoidance of key habitat and sound-enhancing ocean conditions; one of these (the California case) was appealed, and the Appeals Court upheld the District Court's right to impose additional mitigation. The Supreme Court has agreed to hear the Navy's appeal of the decision in its fall 2008 term (the Supreme Court is primarily considering the right of the executive branch to bypass, in the name of national security, environmental laws passed by Congress and may include consideration of the judicial branch's proactive involvement in crafting new standards, but it is unlikely that the Court will wade into the murky waters of evaluating specific operational and mitigation measures). Navy: The Navy has been insistant that its current operational procedures represent the ideal balance between environmental protection and training needs. They continually tout their "29 Protective Measures" as the state of the art in sonar safeguards, and note that cetacean deaths have been very rare. Since the beginning of 2008, the Navy has also more clearly articulated the ways that additional mitigation leads to difficult, and ultimately unacceptable, trade-offs in sailor preparedness. NRDC: The NRDC has long said that its challenges are meant only to ask for "common sense" measures that will allow Navy training to take place while minimizing danger to marine life. They insist that the Navy's measures fail to adequately take into account past experiences in which sonar transmisisons have disturbed or injured marine mammals, and that the Navy is ignoring research studies that do not support its interpretations. AEI FactCheck: In this case, it is difficult or impossible to say with much assurance what is indeed the correct balance between environmental protection and effective training. As we've already discussed, too much is unknown about the nature of the disturbances caused by exposure to sonar transmissions at moderate levels (i.e., distances beyond 100-200 meters). The crux of the debate over additional mitigation is about reducing the intensity and frequency of Level B Harassment, though some of the additional mitigation could conceivably reduce unexpected Level A impacts as well. Given these uncertainties, what we can do is to take a closer look at the Navy's 29 Protective Measures, and at the practical effects of some of the additional mitigation measures being imposed by the courts and resisted by the Navy. The first thing that is clear when perusing this 4-page document is that most of the 29 mitigation measures are "behind the scenes" items: five describe in single sentences various personnel training requirements, including such obvious things as having lookouts review NMFS marine species awareness manuals before sonar is used, and affirming that lookouts will each have a pair of binoculars; another seven cover the specific responsibilities of lookouts, some of which are routine and not related to marine mammal protection; three involve coordination with and reporting to NMFS. Several more refer to documentation to be issued, or such general instructions as "14. Commanding Officers will make use of marine species detection cues and information to limit interaction with marine species to the maximum extent possible consistent with safety of the ship." Sonar to be used at "lowest practicable level, not to exceed 235dB, "except as required to meet tactical training objectives"
Three or more ships operating in an area where animals attempting to escape sonar sound could be trapped by land masses at least 10 miles long and separated by less than 35 miles (also known as "choke points"). Apparently, the "increased vigilance" mentioned is limited to providing a dedicated aircraft to survey for marine mammals before beginning the exercise ("within two hours" of its start, but with no specific observation duration), and if animals are seen, then the Officer in Command "should give consideration to delaying, suspending, or altering the exercise." Safety zones remain the same. Most of the "common sense" mitigation measures advocated by NRDC and imposed by federal court orders have been vigorously opposed by the Navy. In some cases, there are operational considerations not widely understood, which, while not necessarily outweighing the reasons for proposing the restrictions, at least offer a broader picture of why the Navy is resisting. Reducing sonar power when surface ducts are present - Surface ducts are created in particular termperature/salinity conditions that result in distinct layers in the water, creating horizontal channels in which sound propagates more efficiently than normal. So, harmful levels of sound will occur significantly further from the sonar ship than standard modeling predicts and safety zones are designed to accomodate. In order to minimize the chance that whales will be exposed to sound levels that are physically injurious, or that may trigger dramatic behavioral changes that lead to injury or stranding, NRDC and the courts have called for the Navy to reduce the power of its sonar transmissions when surface ducts are present, and/or to enlarge the safety zones dramatically in these conditions. However, from the Navy's perspective, surface ducts represent obstructions in their ability to monitor submarine activity: subs can "hide" under a surface duct, and it takes MORE sonar power to "see" through a surface duct and identify the intruder. While the Navy claims to take special precautions, as noted above, and may be able to avoid sonar use in some cases, it also wants to be able to train its sonar technicians in the special techniques necessary in surface duct conditions. Establishing exclusion zones around seamounts - NRDC urged the California court to set some seamounts off limits to sonar training, because they are especially rich habitat. Again, the Navy was concerned about being able to train sailors in surveillance around seamounts because they, too, can be used as a screen by lurking enemy subs. The Court ruled that the balance of harm tipped toward the Navy's position in this case, and did not exclude the seamounts, though it did set a particular offshore basin off limits due to limited egress and richness of marine life there. Excluding rich habitat and coastal areas - NRDC has also pushed for the Navy to keep its sonar training out of coastal areas (generally suggesting a 12 mile coastal buffer) and other offshore biologically rich areas. While the Navy has not dug in its heels about the coastal restriction, a primary focus of its mid-frequency sonar program is providing better submarine surveillance in coastal areas that have loud background ambient conditions in which quiet subs are not detectable using passive listening systems. It is harder to understand the Navy's resistance to other offshore exclusion zones in areas that offer rich habitat year-round or are important seasonally for feeding, mating, birthing, or migration. Its Atlantic Fleet Active Sonar Training (AFAST) Draft EIS, released in early 2008, included but rejected two Alternatives that would have set aside relatively small areas for biological reasons, and a third that would have designated fixed sonar training areas, based on operational and environmental considerations. Instead, the Navy chose an "Operationally Preferred Alternative" that keeps nearly the entire east coast open for sonar training, claiming that "limiting where naval forces can train will eliminate (the) critical option of training flexibility." The Navy says that sonar training will "typically" occur outside a 12 miles coastal buffer and outside of critical habitat and National Marine Sanctuaries, but rejected Alternatives that would have required such limits. They make no clear case for why they cannot meet specific training needs (near-shore, varied seabed topography, etc.) in well chosen locations, rather than across all east coast waters. 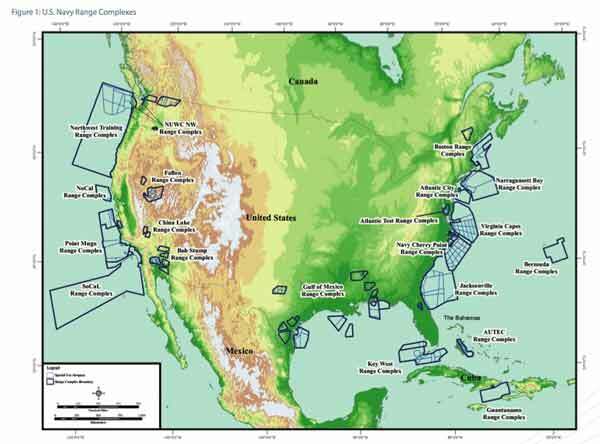 Larger safety zones - NRDC and the courts have consistently pushed the Navy to enlarge the areas around sonar vessels in which sonar will be reduced in power or shut down when whales are present. The Navy proposes reducing sonar power by 6db when whales come within 1000 yards and shutting it down only when whales are within 200 yards; NRDC has urged at least a 2000 meter outer safety zone (reduced power), and the California court actually required sonar to be shut down at 2000 meters, while the Hawaiian court set a 500m shut down zone. The Navy notes that a 6dB reduction in power equates to a 75% reduction in sound and an equivalent reduction in the "detectability" of targets, making it much more difficult to discern the specifics of a target, and reducing the distance at which positive ID can be made. Having to shut down sonar when whales come within a larger safety radius is, of course, even more disruptive to training. However, as noted below, the actual number of shut-downs caused by marine mammals is not that large. Exclusion zone/Shutdown zone balancing - The Federal courts appear to have tried to address Navy training concerns in slightly different ways. The California court rejected most of what they termed the NRDC's "sweeping geographic exclusions," and instead imposed a dramatically larger safety zone, calling for shut down of sonar at 2000 meters (rather than shut down at 200 yards and initial power down at 1000 yards). The court seemed to be suggesting that when no whales are nearby, the Navy should be able to operate quite freely, but that when whales are in the vicinity, a high degree of precaution was in order. In addressing the Navy's strong resistance to the much-expanded shut-down zone, the California appeals court closely analyzed Navy documents, and suggested that marine mammal monitoring information from the six previous Southern California exercises indicated that the 2000 meter safety zone would have only led to 21 extra shut-downs in total, or two to three per week of training. After the 2006 RIMPAC exercises, the Navy reported that shutdowns due to marine mammal interactions (200m shut down zone, with fewer marine mammals than in California) had caused the loss of 8 hours of sonar use during 472 hours of total sonar training. The Hawaii court took a different approach, increasing the safety radii only moderately (initial power down at 1500 meters, shut down at 500 meters), and setting up a scaled power-down routine based on the presence of a 1, 2, or 3 specific environmental factors (such as surface ducts and narrow choke points with limited escape routes). This approach seems to offer the Navy more flexibility in most situations by imposing fewer interruptions in training missions than the California court's approach, while mandating lower power in the types of situations that Navy's 29 Protective Measures say call for "increased vigilance." The Navy would likely prefer to focus on marine mammal spotting in those situations, as the Hawaii environmental-factors restrictions apply whether whales are seen or not; we should note that spotting beaked whales, the most vulnerable family of whales, is notoriously difficult. Pre-Sonar Monitoring for Whales - NRDC has strongly urged more diligent monitoring for whales before sonar is turned on. The Hawaiian court went the furthest in this direction, ordering a full hour of pre-sonar reconnasance by on-board observers, whereas the Navy procedures call for a simple check of the area before starting up the sonar. This question of monitoring diligence is especially important. Numerous studies have confirmed the obvious: whales are extremely hard to find, whether searching the surface with binoculars or listening underwater for their calls. Less than 20% of whales present are likely to be spotted using either method. Since they spend so little time at the surface, a five or ten minute scan will be unlikely to spot whales in the vicinity; longer observation periods with multiple observers will see more of what is there, and aircraft offer an even better vantage point, especially at distances of 2000 or more meters. Beaked whales spend only a few minutes at the surface between 60-90 minute dives, so they are extremely unlikely to be spotted at all. The Navy seemingly feels that the extra observation time is unnecessary, since whales are in fact rarely present at all (as suggested by the figures cited by the California appeals court, that whales only came within 2000 meters 2 or 3 times a week, and the Hawaiian figures that whales were within 200 meters less than 2% of the time). Ironically, both the Navy and NRDC seem to fall prey to excessive concern about what are likely very low risk situations. The Navy insists that its mid-frequency sonar is essential to protecting both our warships and our coastlines from the risk of attack by quiet diesel submarines, increasingly used by Asian and Middle Eastern "hostile nations." Yet how likely is it that, say, North Korea or Iran would indeed attack a US warship or the US mainland? Knowing the retribution that would result, there are few observers of international affairs that suggest such an attack is even marginally likely. It is understandable that the Navy perceives an obligation to assure that not a single US citizen or serviceman is put at risk by such an attack; yet we can also justifiably wonder whether this single-minded focus on absolute security makes it difficult to maintain a balanced perspective. Does the very low likelihood of an attack justify the routine use of this incredibly loud and undeniably grating noise? Conversely, those pressing for limiting the use of sonar rely on somewhat analogous reasoning. When we look at how much active sonar has been used worldwide for the past few decades, how few severe stranding events have apparently taken place, and at the relatively few hours during training exercises that marine mammals are nearby, it appears that the risk of marine mammal harm is also extremely low. Since there have been documented deaths as well as many incidents in which sonar may well have triggered extreme behavioral responses, we can say that the risk of harm to marine life is clearly less than nill, a claim that, thankfully, cannot be made so clearly for the Navy's fear of attack. Still, the Navy is arguably justified in its increasingly frequent reminders that it has operated sonar training for decades on both the east and west coasts, with few harmful incidents (the Navy sometimes claims that there have been NO documented deaths caused solely by sonar, but we will not go that far). From this perspective, the Navy is not being unreasonable when it suggests, as it does in its new EISs, that its current operating procedures are sufficently precautionary. The Navy seems to be insisting on zero risk of attack by lurking quiet subs; meanwhile, NRDC is seeking to take the risk to marine life much closer to zero as well. Surely there is a need for both sides to relax from their rigid sense of what is acceptable risk. I suspect that both sides feel the other is forcing it into their respective rigid stances: faced with Navy refusal to accept any formal territorial or seasonal limits, the NRDC decides it must insist on larger safey zones, while the Navy sees environmentalists and the courts chipping away at its autonomy and feels it must not allow such compromises to its national security authority. As noted above, a key piece of finding a balance between environmental protection and effective training on a practical level is improving our ability to reliably know when whales are actually nearby. A new idea, just beginning to emerge from marine biologists, is the idea of "detectability curves." The thought is that some whales are easier to see or hear than others: they are larger, more vocal, spend more time at the surface, jump more, or their exhalations produce more visible plumes. Conversely, some whales are very difficult to spot, generally because they spend little time at the surface and are not very vocal. While mitigation measures are based on the assumption that we really know where all nearby whales are (so that, for example, we can know that no whales are within the Navy's 200 meter or 1000 meter safety zones meant to protect them from, respectively, physical injury and behavioral disruption), the fact is that the few studies that have looked at the effectiveness of current visual and acoustic monitoring have suggested that we actually see or hear only a very small proportion of the whales that are present. Detectability curves are models (based, as usual, on spotty but ever-improving research) that give us a sense of what proportion of whales we might reliably observe, as we increase the time and ways that we are looking for them. This could be a practical step toward designing (and requiring) marine mammal monitoring that would actually fulfill the purpose of our safety zones and power-down requirements: to be sure that we know when whales are too close for comfort. It certainly makes little sense to assume that the observation techiniques that can reliably spot active, vocal whales such as humpbacks will be sufficient to protect deep-diving, relatively quiet beaked whales. While thirty minutes of diligent visual and acoustic observation might be acceptable for finding nearby humpbacks, it is possible that to achieve a similar rate of detection for beaked whales, we would need to observe for at least two dive cycles (roughly three hours), relying on shipboard and airborne visual observation, as well as acoustic monitoring. Over the past few years of listening to both the Navy and NRDC et al make their cases about the effects of active sonar on marine habitats, and reading countless studies and reports on related scientific research, the Acoustic Ecology Institute has developed an uncomfortably ambiguous view on the issues. We have a clear sense of the ethical considerations at play, wondering about humanity's claimed right to make whatever noise we deem necessary or appropriate in sensitive acoustic habitats. Yet we also have limited patience for overstating the danger into a moral or biological crisis. In its resistance to many of the additional mitigation measures, the Navy has some valid training concerns. Specifically, it makes sense that they be allowed, at least at times and in in well-chosen places with diligent marine mammal monitoring, to conduct sonar training near coastlines, around seamounts, and when surface ducting conditions are present. However, the Navy's adament refusal to formally limit the areas in which it is allowed to train seems excessive. The Navy appears to be asking the public to trust that it will minimize the risk of its sonar training, and will operate in marginally risky areas as rarely as it can. Yet its repeated insistance that nearly every location along both the east and west coasts offers uniquely important training opportunities, and that putting any locations explicitly off-limits will unacceptably compromise training readiness, can not help but undermine its case that we can trust its judgment to be precautionary and balanced. While the courts and the public tustle with the Navy over the specific details of how it conducts sonar training exercises, a giant and unacknowledged presence lurks out of sight. The training that the Navy is so intent on accomplishing without unnecessary impedimentsso that troops deployed around the world are certified as ready to protect our ships and coastlines, as well as allies and global shipping routesis in fact put to use on a routine basis. These well-trained troops are not simply ready to leap into action during a flare up of hostilities, but are using mid-frequency sonar routinely in many different settings, every day, all over the world. The obvious corrolary to this fact is that the Navy's loudly proclaimed concern that excessive shut-downs and power downs may actually endanger sailor lives ring hollow as we realize that such whale-protection safety measures only apply in limited training situations; when out in the "dangerous" world, there are no such limitations. Two common situations in which mid-frequency sonar is routinely powered up are, ironically, in places that are especially contentious in the training controversy. Battleships that accompany aircraft carriers routinely scan the waters around the carriers, especially when entering any ports or harbors; that is, in those near-shore waters that the courts have tried to put off-limits to training, because there is more marine life there. Likewise, US and allied ships routinely use active sonar to scan narrow choke points and straits important for global shipping of both oil and commercial goods, especially in the Middle East and Indonesia. Indeed, the possibility of an attack on commercial ships is probably much higher than that of an attack on US warships. But again, routine sonar use is concentrated in just the sort of deep channels with limited escape routes that are considered especially risky for unexpectedly exposing whales to high levels of sound. NRDC has been very clear throughout its challenges that it has no intention of limiting the Navy's use of sonar "during wartime," which, in today's world, means that routine use is accepted without limits. This amounts to a stance that says, quite simply, that we should be very sensitive in our use of this technology when we can choose when and where to use it (i.e. our training), while accepting that there are national security and global economic security factors that require its unfettered use in the world at large. Once again, the ethical dilemma arises: many will not so easily accept the notion that active sonar should be used freely on a routine basis. Yet so far, these economic and national security arguments have kept those with deeper questions from pushing this edge. As suggested above, the extent of routine use adds credence to the Navy's claims that risk to marine life is quite modest, while also suggesting that the hulabaloo over mitigation during training has only a minimal effect on the global impacts of active sonar. However, it can also be said that it is entirely honorable and just that we exercise our most diliigent sensitivity in situations where that is possible, such as training missions. When we are introducing such loud and potentially disruptive sounds by choice, we should choose the time and place with extreme care, even if in other situations we may feel obligated to proceed with less caution. Who's the Champion of the Sea? AEI FactCheck: If you've read the preceding sections of this report, these absolutist statements, talking point balloons sent aloft from each side, will have probably already deflated and fallen into the dust at your feet. We've already addressed most of the key points necessary to better interpret the actions of both parties to this debate, so will now focus just on a few specific loose ends that fit here in the "We are the Ones" section. We'll look at the Navy's environmentally-oriented offices and consider NRDC's claims of forcing the Navy to alter its procedures, then turn to a final perspective on each of the parties' actions and choice of approach. This section will serve as a brief primer on the outposts within the Navy's vast operational and bureaucratic web that are charged with fulfilling missions that include addressing environmental issues. Most of the Navy's on-the-ground (or water) environmental planning comes out of the OPNAV N45 office, the Environmental Readiness Division. "OPNAV" designates that this is part of Naval Operations (Navy in the field) as compared to the Secretary of the Navy's office (SECNAV, the political/bureaucratic wing of the Navy). Each issue of Currents, the Navy's quarterly in-house magazine, includes a column by the Director of N45, which is a good place to get a sense of the Navy's current internal messaging on the sonar issue. N45 recently launched a website focusing on the Navy's Ocean Stewardship missions, which includes Navy News stories and links to Currents. [GO TO OCEAN STEWARDSHIP SITE] The current Director of N45 is Admiral Lawrence Rice. Meanwhile, over in the SECNAV wing of the Pentagon is the Office of the Deputy Assistant Secretary of the Navy-Environment. This office navigates environmental issues within the executive branch and with Congress. Don Schregardus is currently serving as the Deputy Assistant SECNAV-Environment. While funding for important new research is always appreciated, some in the environmental community express concern about the dominant role that ONR plays in ocean noise research. Some fear that researchers will be overly cautious in their interpretations of results, in order to not undermine future funding (Ed. note: while this may occur at times, it appears to AEI that the vast majority of ONR-funded researchers are diligently seeking the answers we need, albeit at the often glacially slow pace in which science builds on previous results; it is also common to hear researchers say that they experience less meddling in science from ONR than from other funding sources). A more substantial concern is that much of the ONR-funded research is focused on clarifying exactly how much noise specific species of marine mammals can endure before causing physical injury; this focus on injury thresholds seems to some as distracting from subtler behavioral and population-level investigations, or research into creating more biologically-friendly sound sources and passive acoustic alternatives to some of the more troubling technologies. While such research is underway at ONR, outside observers suggest that a broader range of research priorities might be pursued if funding decisions are not primarily channeled through the Navy. The Marine Mammal Commission has proposed that federally-funded ocean noise research be overseen by an inter-agency group chaired by the MMC. NRDC Forces the Navy to the Table? After the strandings in the Bahamas in March 2000, the Navy began taking a closer look at their sonar training procedures and at their obligations under NEPA, the MMPA, and other environmental laws. In December 2000, a memorandum was issued by Under Secretary of the Navy (the #2 man, in this case someone who had been the Assitant SECNAV-Environment before being promoted), clarifying the range of environmental reporting requirements that must be considered when planning routine training, ongoing operations on training ranges, and major exercises. [READ MEMO(pdf)] Among the items addressed were the need to apply to NOAA for "take" permits under the MMPA, and to develop programmatic EISs under NEPA for ongoing activities at Naval traning ranges. At the same time, the memo included a decision-tree to guide managers in deciding whether NEPA would kick in; in many places, the tree called for a judgement about whether it was "reasonabley foreseeable" that planned activities may affect animals after mitigation. It is possible that internal interpretation of this question led to decisions to not proceed with permitting and EIS development for the next several years. In any case, it was not until 2006 that the Navy began, with some apparent pride in shouldering these new responsibilities, to apply to NOAA for Incidental Harassment Authorization permits. In its Spring 2006 in-house publication Currents, the N45 column highlighted the Navy's first-ever IHA application, prior to the summer RIMPAC exercises in Hawaii: "This will be precedent setting for us, ensuring that we understand prior to the exercise what our effect will be on marine mammals, and quantify that effect for the permitting process. This cutting-edge approach should enable us to accomplish this major exercise while working closely with the National Marine Fisheries Service to ensure that we are good stewards of the environment." Of course, to the NRDC and other environmental groups, there was nothing "cutting edge" about the Navy finally meeting the obligations of NEPA and MMPA complianceit was seen as long overdue. It is certainly arguable, at least based on the surface evidence, that the pressure applied by the NRDC regarding mid-frequency sonarespecially the formal letter in 2004 and filing of the lawsuit in 2005pushed the Navy to take its obligations under NEPA and the MMPA seriously. Only in late 2006 did the Navy formally begin the process of developing EISs under NEPA, despite the stated shift in policy way back in late 2000 to address its environmental legal compliance obligations. It is possible that the internal bureaucratic wheels really turn that slowly, but from the outside it appears that for at least several years, Navy planners and managers were making just the sorts of internal judgements about the biological impacts of sonar operations that NEPA is designed to open to public involvement and accountability. In two more specific cases, NRDC's claims of having heroically stood up to Navy over-reach and pulled them into line with their "common sense" approach seem less compelling. In 2003, after the Navy released an Environmental Impact Statement and received permits allowing it to deploy the new Low Frequency Active Sonar system worldwide, NRDC challenged the legality of the permits, which are designed to regulate activities in specific regions with limited timeframes. (This legal challenge led to a revision of the Marine Mammal Protection Act to allow military activities to receive permits without spatial and temporal specificity, paving the way for the revised EIS that came out in 2007.) A federal judge ordered the two sides to hammer out a deployment agreement that both could live with, and what emerged was a plan to limit use of the LFAS system to a remote section of the Western Pacific, which was said to have few marine mammal populations that could be harmed by the long-range sonar sounds. Predictably, NRDC took credit for stopping world-wide use of this new sonic threat, forcing the Navy to test it only in an obscure corner of the world that would not endager whales. What was left unsaid at the time was that this remote location was exactly where the Navy most wanted to deploy the system: near North Korea and China, the two nations whose quiet submarine threat most concerned military planners. The US's single LFAS ship, and soon its second, took up long-term residence in the Western Pacific. In mid 2007, after revisions to the EIS to address the challenges to the first one, the Navy received new 5-year permits allowing LFAS to be deployed nearly anywhere in the world (coastlines and a few biologically important areasstrikingly centered on waters around US territorieswere left off-limits). For the entire year since then, the Navy's two LFAS-equipped ships have remained in the Western Pacific, training sailors to monitor for those Korean and Chinese subs. In August 2008, after a second NRDC lawsuit on the new 5-year permits, the Navy agreed to similar, though somewhat expanded, geographical limits on LFAS deployment until 2012. Strikingly, the LFAS case includes "operatioinal" use, not just training, though it also includes exemptions from the geographical limits that will allow the Navy to operate elsewhere when it deems it necessary. While the NRDC did not really force the Navy to give up much on the practical level in the initial LFAS case, it did serve as a warning that the Navy's legal footing was shaky, and it provided the first of many legal and public-relations victories for those challenging the Navy's go-it-alone approach to sonar planning. We should also give NRDC credit for containing the future deployment of LFAS into the Atlantic or southern ocean, if and when the Navy's focus on China and North Korea expands to other areas (especially as the planned third and fourth LFAS-equipped ships are launched). "With ships of several nations off Hawaii poised to begin one of the Navy's largest international training exercises, a federal court in Los Angeles temporarily halted the use of mid-frequency sonar. The Navy was allowed to proceed with the exercises only when it agreed to take significant, common-sense measures to protect whales and other marine species, such as staying away from the newly designated Northwestern Hawaiian Islands Marine National Monument." [READ AUGUST 2007 PRESS RELEASE] NRDC's statments at the time took credit for a series of other concessions that they contended made all the difference for whale safety; but as noted below, the Navy claims that nearly all of these were already part of their operational plans, even if they were not included in the permit conditions. In early 2007, the Navy formalized some of the disputed additional measures into its official 29 Protective Measures (including dedicated marine-mammal observers and requiring aircraft and passive listening station personnel to observe for whales in addition to their primary tasks). Permits issued for the July 2008 RIMPAC exercises carried substantially the same mitigation standards as the 2006 exercises used, and were not challenged by NRDC or other environmental groups; the state of Hawaii attempted to impose some coastal restrictions, but did not pursue the challenge to court when the Navy did not agree. NRDC: Exaggeration in Service of a Worthy Cause? These and other similar statements create the impression that the Navy is taking no steps at all to protect marine mammals, and that sonar routinely causes such "excurciating injury and death." Citing the IWC Scientific Committee report, without any context, exacerbates this habit of implying that death always accompanies sonar transmissions (in fact, the IWC report focused on the few stranding events that are well known). This strategy seems to be working, as nearly every casual conversation I have in which I mention my work with ocean noise issues leads to a furrowed brow and questions about the whale-killing sonar the Navy is using. However, the two primary aims of NRDC's legal challenges and public "education" efforts are far harder to criticize: to establish that the Navy is not above the law, and to push them to adopt operational procedures and mitigation measures more in line with the international mainstream, so as to make these extraordinary sonic events less likely to disrupt whale populations. As we have seen, larger safety zones (common among allied Navies) and reducing power during surface duct conditions are somewhat less clear-cut than the measures listed above, but are clearly worthy of consideration. On the more fundamental level of holding the Navy responsible to fulfill its legal obligations, NRDC's efforts have been, thus far, affirmed by the courts. While we might have some sympathy with the Navy in the short term, as they work to complete EISs and find themselves losing legal cases because they did not do so earlier, the precedents being set by holding their feet to the fire will likely pay off in the long run. Indeed, most of the lawsuits were filed in 2006 and before, the period in which the Navy did not have formal mitigation measures that it was legally obligated to follow. Since then, their environmental protection efforts, while less aggressive than those of many allies, are at least enshrined in formal IHA conditions under which they are legally accountable. NEPA process comments: As the Navy releases its EISs for various training ranges, NRDC is raising issues in a forum that the Navy must publicly respond to. For example, a 2005 Draft EIS for the Undersea Warfare Training Range, proposed for off the North Carolina coast, spurred comments questioning the Navy's decision to limit its analysis of impacts to within a kilometer of the sonar source, even though some of the stranding incidents (including the Bahamas 2000 and the ambiguous 2006 stranding in this very area) have involved exposures at several kilomters distance; faced with state, environmental, and NMFS pressure, the Navy began revising that DEIS in 2007. Likewise, NRDC's comments on the Atlantic Fleet Active Sonar Training EIS raised concerns about the numbers of Level B Harassments predicted (see above), and urged that these numbers indicate a need to consider alternatives with more substantial areas made off-limits to sonar training. As I talk with Navy personnel and read their statements, I get the sense that most of them are truly mystified at the uproar being made over sonar training, given the very few incidents over the past decades of mid-frequency active sonar deployment. Many seem to feel that judges who imposed additional safety measures did not really understand the modeling of impacts and scientific minutia used by the Navy and NMFS in designing current safetey measures. There really is a sense within the Navy that this is not a huge problem, thought it clearly deserves attention, and that their famous "29 Measures" are sufficient to minimize future risk. Whether the adoption of these formal standards emerged from within after the Bahamas and later incidents, or was triggered by the outside scrutiny spurred by NRDC and others, there appears to be an authentic desire to do what needs to be done to protect whales. I suspect that most additional mitigation measures suggested by others, and even those adopted by allies, are truly considered to be excessive and of little practical value in protecting whales from harm. Even if all this is true, there remain a few areas in which the Navy's approach to the issue leaves much to be desired. First is the focus on being satisfied with avoiding physical injury, which leads inevitably to discounting behavioral disruption as a cause for concern. Second is the seeming deaf ear the Navy turns to any suggestion that it put some areas off-limits to sonar training. Look again at the map near the beginning of this report; can it really be true that every square mile of all those ranges off the US east coast contains crucially unique training opportunities, and that putting biologically rich or seasonally important areas off-limits would cripple our training abilities? This attitude cannot help but undermine the public's faith in the Navy to make balanced, prudent decisions on its own. Third is the vagueness contained in the 29 Protective Measures concerning changes in procedure when the Bahamas-like "contributing factors" are encountered. As noted above, the language here does not inspire confidence that the Navy is taking the threat of injury seriously even in the one very specific set of circumstances that it is convinced is the only situation in which sonar can kill whales. The lack of extended aerial surveys prior to powering up sonar is especially troubling, since beaked whales are so difficult to spot at the surface. Most likely, the Navy simply feels that the likelihood that whales will be present is so low that it does not justify exerting the effort to look for them, or it trusts that in nearly all cases, the whales will hear and avoid the sonar without injury. Even if they are correct in these assumptions, this is a key place where going the extra mile would indicate a level of good faith that is sorely needed to build confidence in their commitment to safe practices. Related to this is the small size of the US Navy's safety zones, compared to those used by other Navies. As noted above, the 9th Circuit Court of Appeals, in deferring to the lower court's increase of the shut-down zone from 500 yards to 2000 meters, noted that "NATO imposes a 2,000 meter shutdown zone when a marine mammal is detectedthe same zone that the district court’s preliminary injunction requires. The Australian Navy goes farther, mandating a shutdown of activities if a marine mammal is detected within 4,000 yards of a sonar-emitting vessel," and further calculated that the 2000 meter zone would only lead to one or two shut-downs per week of training, hardly crippling training preparedness. Finally, the Navy's reluctance to encourage more investigationor even acknowledge enduring ambiguityof stranding events that do not fit the current clear-cut model of sonar-induced stranding is short-sighted, also undermining pubic confidence in its commitment to do its best. While it is difficult to ever really know what caused manyperhaps moststrandings, the Navy seems too eager to brush aside questions about events that don't fit its simple, specific picture. Acknowledging our uncertainty about the ways that animals may react to sonar, and so treating some of the ambiguous events as possibly sonar-induced, would certainly complicate things for the Navy, but it would not tie them to making operational changes based on these uncertain events. It would, however, show that the Navy is authentically considering the full spectrum of possible impacts that its activities may be having, and would allow the Navy to engage more honestly with scientists and environmental advocates as we slowly unravel some of the mysteries and uncertainties that currently limit our understanding. Remembering the crucial point that routine use of active sonar far exceeds the use of sonar in training situations, the Navy could dramatically advance its own cause by being less adament in all these ways as it conducts its training missions. Of course, that would require a long-term institutional commitment to minimize potential harm; and indeed, there are many within the military with authentic desires to work constructively with scientists, regulators, and other civilians, as well as in balance with Congressional and judicial oversight. So far, however, the decision-making apparatus, appears to remain in the hands of those more commited to maintaining the Pentagon's autonomy in the face of public or judicial opinion.